Is there reason to worry? Not if your documentation is in order. When it comes to meaningful use incentive payments, there’s a lot of money at stake. According to figures released in June by the Centers for Medicare & Medicaid Services (CMS), the EHR adoption program had paid out about $15.5 billion in incentive payments. Eighty-five percent of eligible hospitals were registered in the program, and 75% had been paid either Medicare or Medicaid incentive payments. With that kind of cash and that many providers involved, it was seemingly inevitable that audits would become part of the picture. The CMS, which plans to audit approximately 5% of eligible professionals and hospitals attesting to meaningful use, performs both pre- and postpayment audits through its contractor, Figliozzi and Company. That’s understandable. If an audit reveals the provider isn’t eligible for an incentive payment, the award will have to be returned. And if it’s determined that a provider attested fraudulently, the CMS warns that punishment could include imprisonment, significant fines, or both. While some providers will become audit targets because they’ve provided “suspicious or anomalous” data, most will be selected randomly, which means it’s impossible to make an attestation audit-proof. According to the CMS, eligible providers should be retaining the “relevant supporting documentation,” either in electronic or paper form, that was used to complete the attestation module. This documentation should be retained for six years after attestation. Documentation is the key word when it comes to what auditors are seeking. Jim Wieland, an attorney with the Baltimore-based firm Ober Kaler who represents several providers that have gone through the auditing process, says auditors are looking for documentation that can verify the EHR system used to meet meaningful use requirements is certified as well as supporting documentation proving that core and menu objectives were met. As the starting point of any audit review, the primary documents should include the numerators and denominators for the measures, the time period the report covers, and evidence to support that it was generated for that eligible professional, eligible hospital, or critical access hospital. The CMS advises providers that the process could extend beyond the primary review step and consist of more detailed analysis of any measure, including a review of patient records. With that in mind, Waegemann says it’s important for hospitals to have a good understanding of how the original attestation was performed and who was involved. The person who handled the attestation may have moved to a different organization or maybe particular individuals strongly influenced the process, he says. “The moment you know an audit is coming, you need to revisit that process,” Waegemann says. Ed Ricks, vice president of information sources and chief information officer at Beaufort Memorial Hospital in South Carolina, said the organization is well prepared for an audit. “We are an organization that has always put a value on how technology can help us not just do cool things but also solve some of our clinical and business workflow challenges,” he said in a June webcast sponsored by Iatric Systems, an HIT integration company. 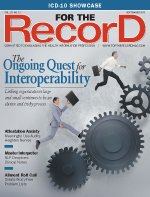 When meaningful use became a reality, Beaufort, like the majority of the nation’s hospitals, got involved. Suspecting audits would, at some point, become part of the equation, Ricks said Beaufort took precautions. “We wanted to make sure that when we checked a box, we meant it, and it was good,” he noted. Beaufort hired an outside firm to perform a gap analysis to help determine where there may have been holes in its meaningful use approach. It created a master plan and formed a disciplinary meaningful use committee consisting of representatives from all over the hospital, including the clinical, IT, finance, and compliance departments. “I was really proud of us,” Ricks said. “We attested the first year we could, which was fiscal 2011.” The hospital’s 90-day reporting period was the last quarter of the fiscal year (July through September 2011), after which it accumulated all the data and ran all of its reports. And wouldn’t you know it, the audit request arrived. “I was almost happy to get [the audit notification] because we wanted to prove that we had done the right things,” Ricks said. When a provider is selected for an audit, it receives an initial request letter from Figliozzi and Company via e-mail. The notice is accompanied by an information request list that, according to the CMS, “may not be all inclusive” and may require the submission of additional information in order to complete the audit. Providers have 14 days after receiving the request to supply the requested information. Are two weeks enough time to gather the necessary data? Laura Kreofsky, meaningful use program director for California-based Sutter Health, believes the time frame is reasonable considering the anxiety created by an audit. “It is something you would like to get out of the way, and this forces you to get through the process,” she says. Of course, there’s no guarantee that once a provider has responded to the initial request for information that the auditors won’t come back asking for more. That’s what happened at Beaufort. Ricks and his team responded to the audit request within the allotted 14 days and then waited. After a few weeks, the auditors came back with further requests and questions, such as why the logs generated by the EHR didn’t carry the vendor’s logo, representing concerns that the documents could be fraudulent. Beaufort received one more request, this one warning the hospital that it risked losing its incentive payment if it couldn’t satisfy the auditors that it was complying with certain measures, in particular, drug-to-drug formulary checks. Ricks’ efforts to demonstrate compliance in this area failed to convince the auditors, and it took a phone call to finally resolve the issue. Some providers actually have performed self-audits, found problems with their attestations, and then gone through the process of withdrawing those attestations, which involves submitting a withdrawal form and returning the incentive payment. Wieland says the advantage of this strategy is that it suggests there was no intent to defraud the federal government and that the faulty attestation was simply an honest mistake. According to Kreofsky, several Sutter Health eligible professionals withdrew meaningful use attestations when problems became apparent during self-audits. In those cases, the troubles stemmed from a CMS requirement that eligible professionals demonstrating meaningful use must have at least 50% of their patient encounters during the EHR reporting period at a practice or location equipped with certified EHR technology. Gary Tomlinson, a community access hospital consultant for the Massachusetts eHealth Collaborative, which operates the regional extension center of New Hampshire’s meaningful use services and health information exchange technical services for the state’s 13 critical access hospitals, is in the process of creating a simulated audit. As the IT director at Cottage Hospital in Woodsville, New Hampshire, Tomlinson learned about the value of documentation when the facility attested to stage 1 meaningful use in 2011. He’s using that knowledge to help guide the 13 New Hampshire hospitals—particularly smaller ones such as Cottage—through the process, including possible self-audits. “It’s better to spend a few thousand dollars having a [simulated] audit done rather than have to return millions of dollars,” he says. The CMS emphasizes that it is the provider’s responsibility to supply documentation backing meaningful use and the clinical quality measures data used for attestation. This includes saving any electronic or paper documentation that supports the values entered in the attestation module for clinical quality measures.